Tess Appeal - Can you help? 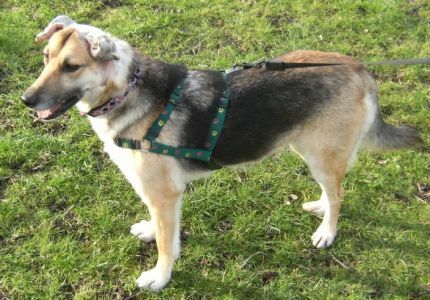 Tess is a beautiful GSD Cross. She is extremely thin and has been suffering from a chronic allergy. This little sweetheart is only 16 months of age and has probably suffered for all of her short life. 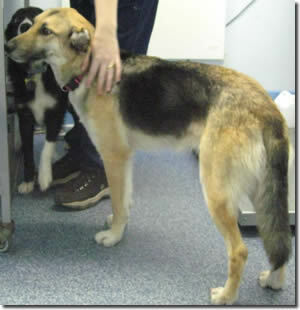 Tess was found and taken to the pound where her owners failed to collect her. It is quite possible that this lovely little girl was thrown out due to her condition which has obviously been neglected for some time. Despite her problems and obvious discomfort she has an adorable temperament and is proving to be very loving and friendly. 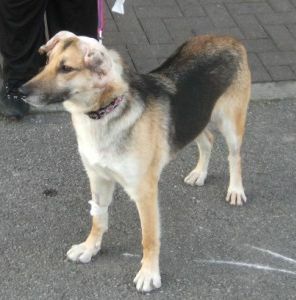 Tess is on treatment and will need ongoing care and surgery for her badly infected and damaged ears. This poor girl must have been in so much pain and discomfort for a long time. 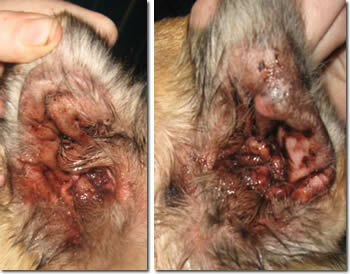 During her stay with us, she has received regular treatment for her condition, namely regular ear drops and care. On her visit to the vet today she has not improved - in fact her condition has continued to worsen. Due to previous neglect, unfortunately Tess has severe damage to both ears and she will need to have both ear lobes amputated. 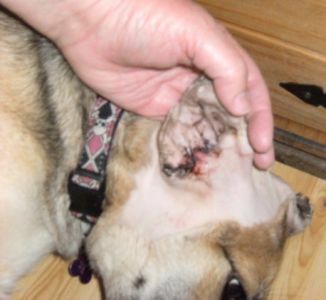 Also both ear canals are so badly damaged and are full of thickened skin, lumps and sores that she will need total canal ablations on both sides, ie. both ear canals need removing. THIS WILL NEED TO BE DONE BY A SPECIALIST WHICH WILL COST £700-£1000 PER EAR! The operation is quite risky but without it she will spend her whole life suffering. She will be left with limited hearing after the operation but at the moment she only has limited hearing anyway and is in so much pain and discomfort. She is in foster care at the moment but we are not sure how long she can stay there so she may need a new foster home to recover in if the operation goes ahead. She has been given different steroids and further ear drops and she needs to go back to the vet in 1 weeks time to talk about booking her in for the op. She is a lovely friendly girl, everybody who meets her falls in love with her. She is wonderful with other dogs and she has such a gentle nature, she loves to be cuddled up close! If you can give this lovely girl a foster home if needed, please contact us (details on our contact page). Alternatively, if you would like to make a donation, however small, towards Tess' treatment to give this girl a better life, please use the PayPal link below. Any money received via this donation button will be reserved solely for her treatment. £2000 NEEDED - AMOUNT RAISED SO FAR = £2220 - WE HAVE DONE IT! Thank you all so much. Tess has now been referred to the specialist and we are waiting to hear back from them. In the meantime Tess is coping as well as can be expected and the new steroids do appear to be helping her to feel a little bit more comfortable. She sends love and big licks to you all! UPDATE - Wednesday 30th January 2008 - Tess has her appointment to see the specialist at 11am on Tuesday 5th February 2008. As long as everything is ok she will be staying in for the op. and all being well will be able to go back to her foster home a couple of days later. Please keep your fingers tightly crossed for dear Tess, she's a very special lady! UPDATE - Tuesday 5th February 2008 - Well we all had a sleepless night last night for nothing! Tess saw the specialist today and although we thought that the operation was going to go ahead today, the specialist has booked her in for the op. on Monday 11th February. It looks like more sleepless nights are ahead! UPDATE - Monday 11th February 2008 - Tess went in for her operation today. Unfortunately there were some complications with the surgery. Her left ear was very badly damaged inside and the procedure took longer than expected, so they have only done the one ear today. The good news is that other than the time it took, the operation went really well. Tess is recovering nicely with no immediate signs of any nerve damage and she appears happy and is in good spirits. She will rest tomorrow and they will perform the operation on her right ear on Wednesday. Then hopefully she will go back to foster on Friday, bless her. UPDATE - Wednesday 13th February 2008 - Tess had her right ear done today and it all went very well. There were no complications at all and Tess again recovered well from the anaesthetic. She will stay in tomorrow and all being well on Friday she will definately be going back to her foster home. 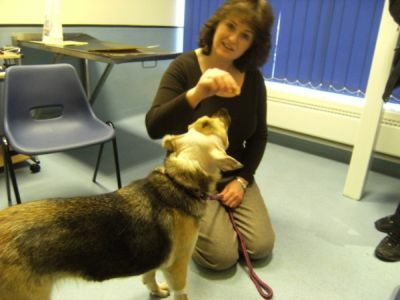 UPDATE - Saturday 16th February 2008 - Tess is back in her foster home! She has done really well, she was very tired last night which is to be expected but it's onwards and upwards now for dear Tess! Tess with Pru, the specialist who did such a wonderful job. It was difficult to get this photo as Tess wouldn't keep still, she was so exited to see her fosterers! Coming out of hospital and taking in the fresh air. Her ears now, looking so much better. UPDATE - Saturday 8th March 2008 - Well, we did it...........Tess is now a happy and comfortable girl. Her hearing is no worse than it was before and she is so much happier now, no more itchiness and soreness. Thank you to Ian and Sarah at Lowerplace Vets in Rochdale, to Pru the specialist at Rutland House, St. Helens and to Tess's wonderful foster parents Trish and Chris. Most of all THANK YOU to each and every one of you who donated and supported us and made this possible! 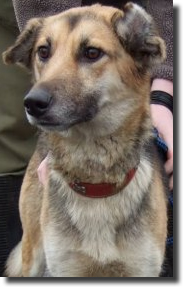 UPDATE - Monday 1st September 2008 - Tess is still desperately waiting for her forever home to come along. 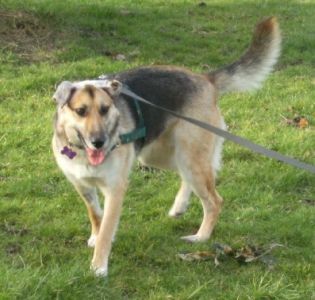 If you can offer Tess a loving home please contact Margaret on 07530 147359.